Product Condition: The Flight Insulated Jacket - Men's is in Excellent condition. This jacket was too small and needed to be exchanged. The tags have been removed but it is like new otherwise. Stay warm when the temps drop without drowning under a bulky jacket you don't need with the Volcom Flight Insulated Jacket. Whether you're squeezing in a few more days at the skate park before the snow flies or walking to class, the Flight's slim silhouette and synthetic fill will keep you toasty, without overdoing it. Volcom trusts a durable nylon shell to handle the wear-and-tear of everyday life, along with a water-resistant treatment that equips it to handle an unexpected drizzle. 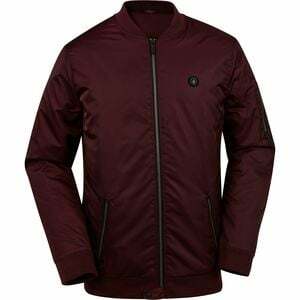 The jacket's regular cut means you can layer your favorite flannels underneath without any fit issues, and contrasting zippers give the Flight some classic Volcom style. Low-profile cuffs and a sleek collar round out the less-is-more attitude of this jacket, and two subtle hand pockets provide refuge for your digits on days when the wind bites.